Nestled in the foothills of Los Gatos, centrally located just three minutes from downtown Saratoga La Hacienda Inn is close proximity to renowned wineries, great shopping, and scenic areas such as Carmel, Pebble Beach and Santa Cruz beaches. It offers fine accommodations in a country-like setting that is immediately familiar, friendly, and private. Each guest room features comfortable custom pine furnishings with deep stain finishes, and amenities like refrigerator coffeemaker, data port on telephone, pool towels, dry cleaning service, free parking and on-site guest laundry. Nearly all rooms are located around the swimming pool and each has a private patio for relaxation. 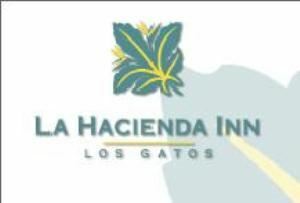 La Hacienda Inn Conference Facility is a perfect location for conducting private and successful meetings, seminars and retreats for small groups. Set within a former residence on the premises, the Conference Facility features a 425 square foot meeting room, a kitchen, private restroom, an entry patio, and a shaded private rear deck, ideal for use as an outdoor break site. Weddings are particularly successful at La Hacienda Inn. For Outdoor Wedding the private wedding garden is a great location for a ceremony complete with a decorative wedding trellis, and guest seating for up to 125. Or you can gather your guests on the Wedding Patio, a covered, outdoor Italian tile patio where up to 200 guests can celebrate, dine and dance in honor of your marriage. A beautiful climate, lush landscaping, finely furnished rooms, and a personable and professional staff combine to make your stay at the Hacienda Inn a treat beyond the ordinary.